It has been dry, and recently announced that rainfall for the year was short be several inches. We could see it here in small ways, nothing critical. And then yesterday steady rain for most of the day. Rain a few days ago. Rain several more days this week. And now there is this. Worm castings. Soil building at its most elemental. As earthworms move they displace the earth and leave...poop behind. 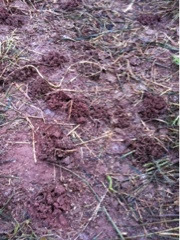 The soil has been lightened by the worms, as they dig it creates millions of holes all over the farm, and the water can be absorbed. The worm castings feed the soil. The grasses and flowers love it and grow stronger faster. And the livestock get fertilized, nutrient rich food. As the castings decompose they set in place just what is needed for the pastures. And the roots have holes to expand into underground. All of this happens because we rotational graze. Because the pastures are eaten and left to rest and regrow, pressured then left alone. The fields grow stronger and more nutritious forage. Yum.